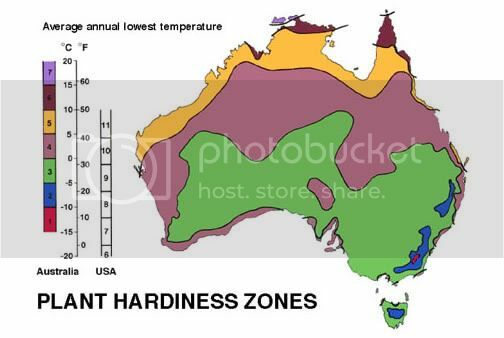 What are plant hardiness zones and why are they important? Well, plant hardiness zones are a guide to help you know which plants will grow and survive where you live. 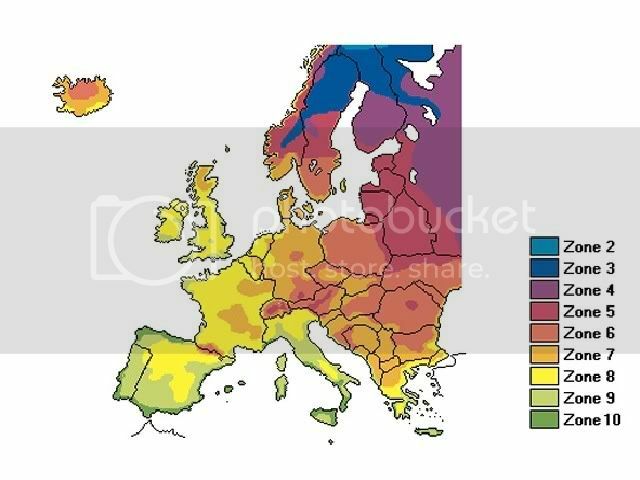 The plant hardiness zone maps below will show you if certain plants can manage your areas temperatures. Plants vary in the temperature extremes they can endure, the lower temperature especially being an important factor. Due to the moderating effect of the Gulf Stream on the Irish and UK's temperate maritime climate, the UK, and Ireland even more so, have rather milder winters than their northerly position suggests. 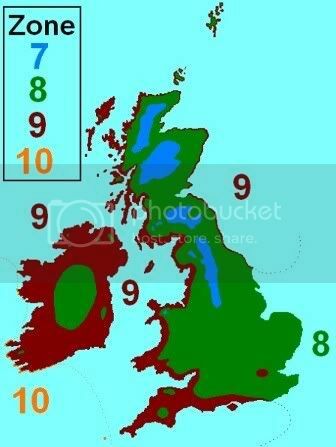 This means that the hardiness zones relevant to the Ireland are quite high, from 8 to 10, as shown below. * 7. Central Scotland and the Highlands, and locally in the Southern Uplands and the Pennines. * 8. Parts of central Ireland and Most of England, Wales and Scotland. * 9. Most of coastal Ireland, western and southern England and Wales, western Scotland, also a very narrow coastal fringe on the east coast of Scotland and northeast England (within 5 km of the North Sea). * 10. Very low lying coastal areas of the southwest of Ireland, and the Isles of Scilly. So, looking at the map we can see that the south coast of Ireland is a zone 9 and has a lowest possible temperature of -7 to -1 C (20 to 30 F). If we had a severe frost across Ireland, frost susceptible plants in the south may have a better chance of survival then similar plants in the midlands of Ireland. Many plant books and labels state the zone hardiness for plants, it will serve you well to heed them. Definitions of Frosts and the possible damage caused. 0Â° Celsius is a commonly called a touch of frost. The damage to your plants should be slight, however, it depends upon the duration of the frost, topography of the growing area etc. Your very tender plants may be killed with little effect on other hardier vegetation. Many plants in your garden will be damaged especially fruit blossoms and tender plants. sustained -5 Â° Celsius and colder is regarded as quite a Severe Freeze here in Ireland. Below this temp you will experience damage to all but the hardiest of your plants. 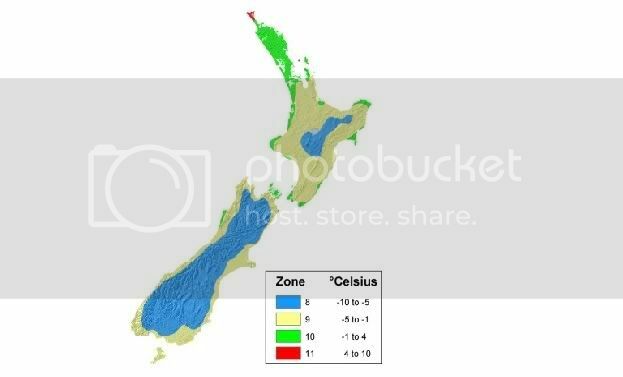 New Zealand has very similar plant hardiness zone zones to Ireland. Lots of plants native to New Zealand thrive in Ireland. 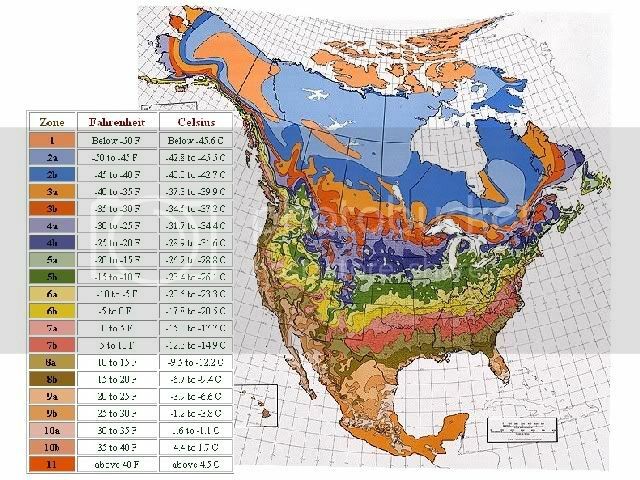 For some extremes of temperature, here is the US, Canada and Mexico plant hardiness zone map. Here is the USA map on its own.